Romantic riverside setting. Bridge House is situated in the heart of historic Callan town with its many traditional pubs, historic sites and shops. 'Riverside location. Superb riverside terrace and garden. Minute walk to pubs, shops, restaurants. Local historic sites including Augustinian Priory behind the house. Only 10 minutes from medieval Kilkenny city. Delightful river views from most rooms. 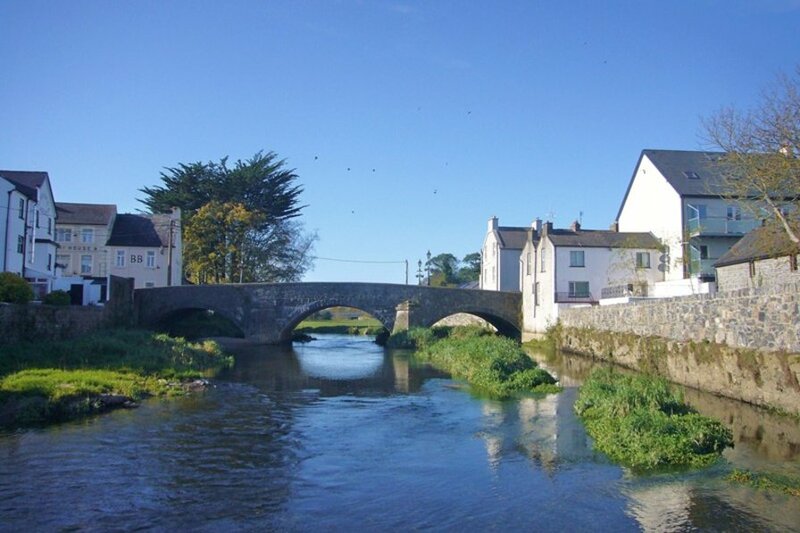 This 4 bedroom townhouse offers the best of both worlds - romantic riverside setting with lovely views of King's River and Bridge (circa 1800) whilst being situated in the heart of historic Callan town (one of largest towns in Kilkenny) founded by William the Marshall in 1207. In 2005 Neil Jordan's film "Breakfast in Pluto" starring Liam Neeson and Cillian Murphy was filmed here and in 2007 Callan celebrated its 800th year! Inside Bridge Houses are 2 floors: ground floor comprises hall leading to a large kitchen, separate dining room with patio doors to a large riverside terrace, lounge, reading room and separate wc. Upstairs there are 2 single bedrooms and 2 double (one kingsize bed), all with built in wardrobes, plus main bathroom with shower cubicle, toilet and basin. There is a large south facing riverside terrace to the back with steep steps down to a riverside paved patio and large lawned garden with hardstanding for a car. There are many places of interest in the immediate vicinity including The Moat just off Bridge street, one of Ireland's best preserved Motte-and-baileys, The Workhouse in Prologue, Callan and Callan Augustinian Priory, to name but a few. Callan is the birthplace of some famous people including Edmund Rice founder of Christian Brothers (whose childhood home is still in place), poet in exile John Locke (1847), James Hoban (who designed the White House), Irish painter Tony O'Malley. Callan has a good choice of traditional pubs, shops including supermarkets and restaurants as well as good road and bus links to other main towns and cities. Medieval Kilkenny city is a mere 10 minute drive away. River views from most rooms. Lovely south facing riverside terrace accessed via dining room patio doors. Steep steps down to south facing riverside lawned garden and patio area. All bed linen (apart from cot linen) provided. Electric central heating and electricityis is payable via a prepay card meter which can be topped up locally. Children are most welcome but PLEASE NOTE: Due to the proximity of the river to the property, young children MUST be supervised at all times whilst in the garden and terrace. BBQ area; adjacent to river so young children must be supervised.